U.S. Naval Academy Alumni Association of North Texas - USNA SWAG at the BIGGEST NAVY @SMU Football Game Tailgate EVER! Welcome to the U.S. Naval Academy Alumni Association of North Texas - USNA SWAG at the BIGGEST NAVY @SMU Football Game Tailgate EVER! During the last SMU/Navy game tailgate, we were overrun with requests for USNA items and gear. We heard you loud and clear! This year we are offering several items, more each week so keep checking back! All items are of limited quantity - some very limited quantities - as we did not want to over buy for obvious reasons. If you are interested in any of the swag below, we strongly recommend you pre-order the items for pick-up at the tailgate. Anything not pre-ordered will be available for sale at the event onsite. Do not miss out on one of these! 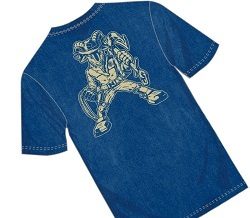 Check out our original Bill the Goat design! This is the first time EVER for the Chapter to launch a USNA-themed design, and the first time ever to offer T-shirts! 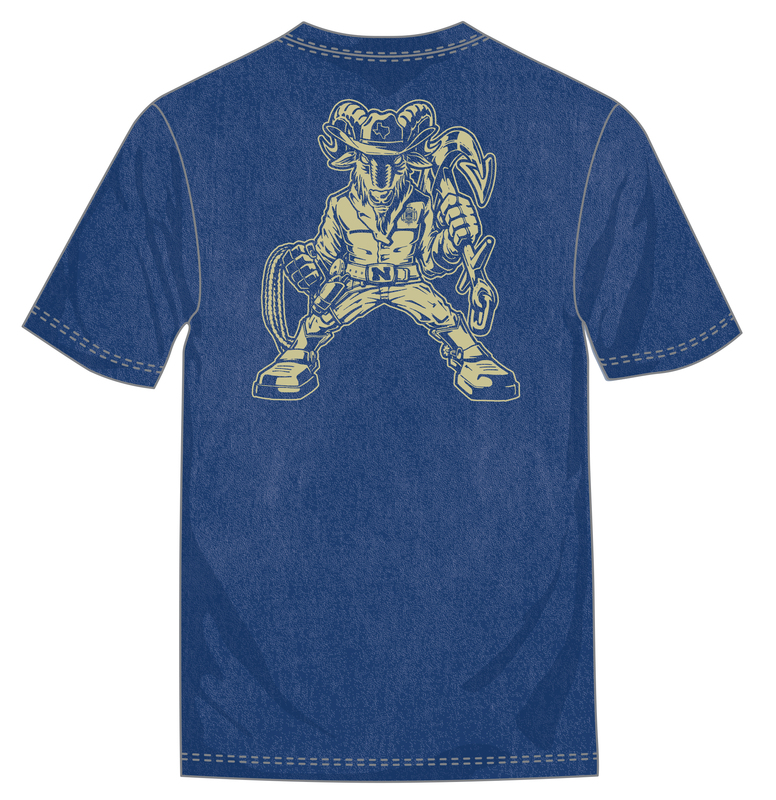 The shirts are a high quality brand, Comfort Colors®. Comfort Colors offers the ultimate comfort in clothes designed with a nature-inspired color palette. They have spent the last 40 years perfecting the dyeing process and don’t cut corners.Their unique dyeing processes allow for a worn-in and weathered look without the clothes losing shape or shrinking, since Comfort Colors washes them 50 times before they are shipped out! We have sizes from XSmall all the way through XXLarge - but a limited amount of each. Has the custom Bill the Goat design. The best part is that SMU Athletics has approved the bags AND you can take your empty tumblers and water bottles into the stadium! 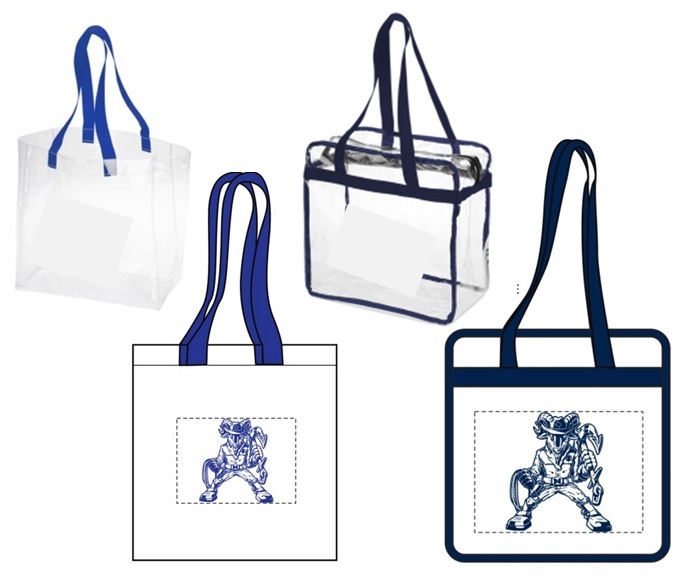 These stylish Navy stadium bags are just the right carriers to do so! Also - the design has GO NAVY! at the base of Bill the Goat (not shown here). SMU approved bringing empty tumblers into the staduim. 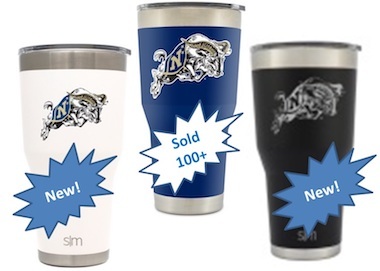 Check out these really nice 30 oz, USNA officially licensed insulated drink tumblers. They have been so popular over the past year that we are expanding the color choices. Initially we only offered blue, but for the first time . . . you can also purchase them in white and black. We ONLY had 40 tumblers in each color. The ones we are now selling have an upgraded lid design with a flip hinge! Keeps drinks hot for 8 hours, and cold for 24 hours. And now for the icing on the cake . . . the vendor will donate 10% of every purchase to the Chapter's donation fund! SMU approved bringing empty water bottles into the staduim. 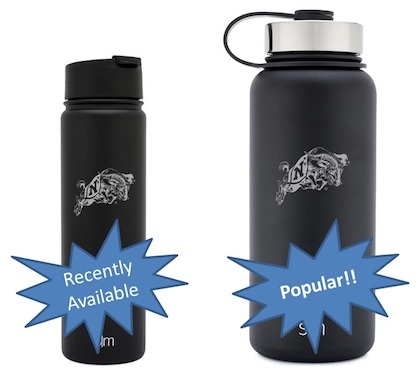 First unveiled at the Summer Picnic in June, we are now offering USNA officially licensed insulated water bottles from the same company as the insulated tumblers with the same great qu ality. We sold out of the 32oz size at the picnic so we placed a larger order this time. Medium 22oz (ordered 30) which is perfect for cup holders. The vendor will again donate 10% of every purchase to the Chapter! Swag questions can be directed towards Stacie at stacie@SACLeadership.com. Click here to buy swag!! !